The Designers of Goodnight Desdemona (Good Morning Juliet) are working away to build our world. Take a look at their works in progress! 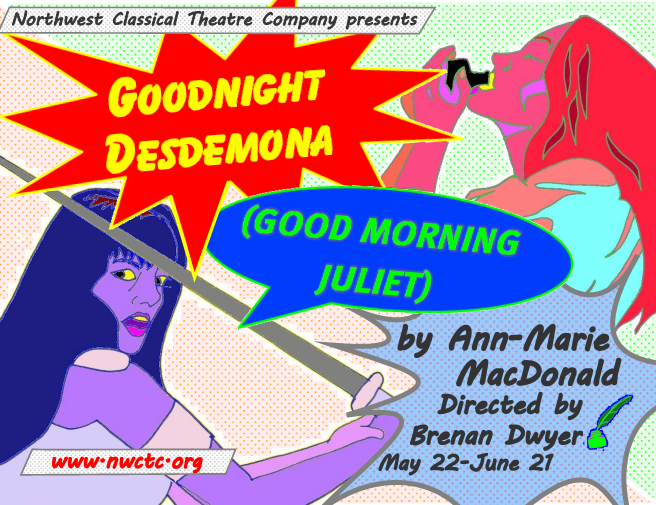 Northwest Classical Theatre Company concludes its seventeenth season withGoodnight Desdemona (Good Morning Juliet), an action-packed, hilarious homage to Shakespeare and the people who love his plays. This production will be the last for the company in its current format; moving forward NWCTC will no longer keep a resident acting company nor claim the Shoebox Theatre as its home. In Goodnight Desdemona (Good Morning Juliet), Constance Ledbelly, a Shakespearean scholar, postulates that two of the Bard’s best-known tragedies, Othello and Romeo and Juliet, are based on comedic source material. Constance researches firsthand when she takes a tumble into her trashcan and lands in the worlds of the plays where her presence rapidly causes the plots and characters to change: Iago and war-like Desdemona team up, death-obsessed Juliet and bi-curious Romeo tire quickly of marriage, and Constance is tasked with finding the author of it all. Join us for this adventurous production before we say goodnight to Northwest Classical Theatre Company as we know it, and stay tuned for more details on the rebirth and continuation of the company as we near the season’s end. Six days before the death of her father, James V, (after battle with the English in southern Scotland) Mary Stuart was born on December 8th 1542, in the great royal palace of Linlithgow in Scotland. She was his sole legitimate heir. The infant was crowned Queen of Scots in 1543. At that time there was a lot of unrest in Scotland, what with the English attacks and the strong support many of the Scottish lords were giving the new Protestantism. Her mother, the French Mary of Guise, decided to send her infant daughter to France for safety and the comfort of her own family in 1548, while she stayed in Scotland as the Regent. Mary passed her childhood in France; she was educated by French scholars and musicians, spoke a variety of languages with French being the language she preferred, wrote poetry, danced, played the lute, and was a master embroiderer. She was talented, accomplished, and beautiful. As planned, in 1558, she married the fifteen year old Dauphin, who became king the following year. Now she was queen of Scotland and France. Sadly widowed less than two years later, she returned to Scotland as its queen after an absence in France of thirteen years. When she arrived in Edinburgh in 1561 to take the throne she was a naive, Roman Catholic nineteen-year-old with no prejudice against those who preferred the reformed faith. She was unaware of the power of the new Reformation that was to lead to civil war, an eventual Protestant coup, a humiliating “trial” and her own abdication in 1567. Unfortunately, her reign and life itself brought her tragedy: the murder of her beloved friend Rizzio in front of her eyes, the subsequent murder of her second husband, Darnley, the exiling of Bothwell, her third husband, and suspect in the abusive Darnley’s murder, the birth of her son, James, who was taken from her to be brought up in the Protestant faith, and a constitutional revolution ending in a deposed Mary. She finally decided to throw herself upon the mercy of her cousin and rival, Elizabeth in England. The year was 1568. Unfortunately, Mary survived religious revolt and political opposition in her native land only to be denied her eventual freedom and was imprisoned as a threat to Elizabeth at age 25. Mary requested many times to meet with Elizabeth face to face to explain her case. This never happened. Finally, after 19 years later in prison, at the age of forty four, Mary experienced her violent death, brought about by her rival and “sister”, Elizabeth, Queen of England. In three sentences, describe the character you play in Mary Stuart. What is your favorite line in the play (yours or someone else’s) and why? What is the biggest challenge for you to overcome in this role/play? As a Scot myself, I was brought up to idolize Mary Stuart. I didn’t really know why–just that she was unfairly killed by the English Queen Elizabeth. (I also grew up with a good humored enmity for the English–it seemed to have been built into Scottish history.) In taking on the role of Mary, and really having to bring her to life, one of the more curious challenges was to figure out her dialect. My romantic image of her would be, of course,to have a Scottish accent. But in my research, I had to come to terms with the fact that she was more French than Scottish. Although born in Scotland to Mary Guise (a French woman) and James V (King of Scotland)–her father died and in one of the first acts of protection, her mother sent Mary to France. Here she was brought up in a highly sophisticated court. She spoke mainly in French and was known to have thought of French as her first language (It is said that it is the language in which she thought and wrote). But she was also a highly intelligent woman,great at languages and also a musician.Therefore, she is able to adapt her language with ease (she can “code-switch”). I did a lot of research to just find her voice. I, myself, used to have a Scottish dialect when I first came to this country at age 3. I don’t have one now, except for a couple of words. Mary was 6 when she went to France, so there would be certain Scottish sounds that would stay with her. (She would not, for example, be unable to make the “h” sound in English–as so many French dialects might exclude. She would keep the flat “a” of the Scots). Ultimately, in exploring different options, when I spoke her words in a French dialect with Scots sounds, I felt more of what she must have felt like. More of a woman, not really all Scottish, not really all French. It made me feel like an outsider in England, in Scotland, and in France. And so, I have found the voice for my Mary. If you could choose one song that represents this show for you, what would it be? What have been some of your favorite shows to work on in Portland? This is a tough question! Each role has brought its own joy–whether working and getting to know fabulous creative people, taking on a huge challenge, telling a story that needs to be told. What are your non-theater hobbies? hmmm…my day job, being a mother to a 17 year old, and flying Southwest Airlines to visit my boyfriend in the Bay Area. When I have time, reading,making earrings, cooking, playing my viola. What’s your favorite bar/restaurant/venue for post-show theater debrief? What’s around the corner, or my parent’s dining room. If you could dedicate your performance to someone, who would it be and why? It would be to my mother, Dorothy, who has filled my life with love of Scotland. Among the many songs she sang to my sister and me, one always haunted me. It was “The Queen’s Maries”-a song about a lady in waiting to Mary (Mary had four ladies in waiting, all named Mary). Years later, when my daughter Isabella heard the song, she too was haunted and ended up writing an historical fiction novel inspired by it. My mother’s voice is filled with the beauty and the passion and the love of the Scots and is someone Mary Queen of Scots would have loved. Hannah Kennedy is Mary’s lady-in-waiting, nurse, servant, mother-figure, and friend. She is fiercely loyal and protective, almost to the point of denial of any kind of guilt on Mary’s part. She is also pragmatic and realistic, and tries to keep Mary’s feet firmly on the ground in her moments of romantic rapture. By the end, however, it is Mary’s strength that keeps Hannah from crumbling in the face of grief and injustice. I love the image of Mary as a lapwing…a bird so often to be seen on the Scottish moors. And what is so compelling about this is, of course, that the lapwing only appears broken. It “acts” broken, to lead predators away from its nest, and is therefore astonishingly strong. Is Mary truly broken? Or is she still hiding something? We know by the end that she is strong. Is she so strong that she can even go to her grave without giving everything away? This question is very much the crux of the encounter from which this quote is taken, and not resolved until the very end of the play, if at all. So it is a beautiful, but also a clever image. As with the previous question…so many, so many! But for the purposes of this blog, I think I would isolate the notion that Hannah is both very like me and very UNLIKE me. I have to focus on her forthrightness, her down-to- earthness, her absolute will to appear…and be…strong, where Cate would probably give in and let go much sooner and more often. Of course Hannah does let go also, but she and I have a very different tipping point. Well, speaking from my character’s point of view, Hannah’s love for and loyalty to Mary is so powerful that, although it is NOT by any means a romantic or sexual love, the song/poem that comes to mind is of course Robbie Burns’ “ A Red, Red Rose.” I think many people felt this way about Mary, both before and after her death, and of course that is what Elizabeth could not tolerate. My father, Allan Nicol, was a Scotsman. Hannah’s idiolect is based on his. He died, unjustly and innocently, in a senseless road accident when I was a little girl. His absence in my life has been as real as any presence. I would dedicate all Hannah’s words, and love, to him. 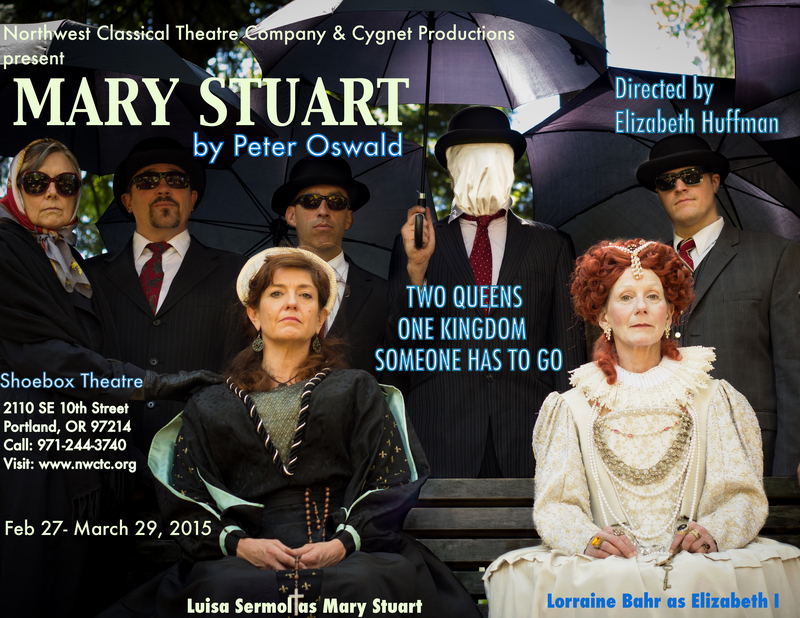 Balancing the world of Elizabeth l with a contemporary sensibility, this production of Mary Stuart will feature an original score, composed by world renowned musicians Gayle and Philip Neuman. Recorded on Renaissance instruments, many of them built by the couple, then remixed electronically by sound designer Sharath Patel, the score is an uniquely provocative musical landscape that spans over the centuries supporting the story’s examination of women in power, then and now. 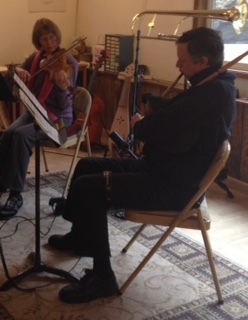 Here’s a photo of the master musicians at work recording their original score! Click on the link below to see a 2-minute preview of the forthcoming Mary Stuart, presented by Northwest Classical and Cygnet Productions.